Violence has flared up in Georgia, where Russian tanks have been seen patrolling the town of Gori. People leaving Gori say there is looting going on involving South Ossetian separatists. A convoy of Russian vehicles has been seen on the road to Georgia's capital but Russia and a Georgian minister have denied it is heading to Tbilisi. The BBC's Sarah Rainsford in the South Ossetian capital, Tskhinvali, says many buildings have been totally destroyed. A ceasefire is in place, but it seems to be very fragile, correspondents say. Russian tanks seem to be dismantling and destroying Georgian army bases in Gori, reports the BBC's Gavin Hewitt from just outside the town. Meanwhile, Russian defence officials said the Russian military had shot down a Georgian spy drone over Tskhinvali, overnight and accused the Georgians of continuing military activities despite the ceasefire deal. Georgia's President Mikhail Saakashvili told the US network CNN that Russian forces were moving towards Tbilisi and planned to encircle the city. However, Russia denied reports that its forces were heading that way. Georgian Deputy Interior Minister Ekaterine Zguladze also said that a convoy of Russian tanks had left Gori but was not heading for the capital. Foreign ministers from the European Union, speaking in Brussels following emergency talks, expressed broad support for proposals to send EU peacekeepers to the area to supervise the French-brokered ceasefire, after a United Nations resolution is passed. "We are determined to act on the ground," said French Foreign Minister Bernard Kouchner. EU foreign policy chief Javier Solana said the EU was committed to providing humanitarian aid and assistance with reconstruction once the security situation allowed. A key element of the peace deal calls for all forces to return to the areas where they were before fighting broke out last week. In Gori, there are reports of residents being stripped of their belongings at gunpoint at the entrances to the city. A pall of smoke hangs over the market, but it is not clear if any more fighting has been going on. Residents have spoken of their houses being torched, and the situation may well be worse in outlying villages, Gavin Hewitt reports. There is also a Russian checkpoint with two Russian tanks outside Gori on the main road leading into the town from Tbilisi, an eyewitness told the BBC. But the Russian foreign ministry says it has no Russian troops left in Gori, Reuters news agency reports. 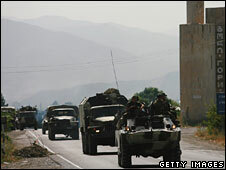 The BBC's Richard Galpin, at a police checkpoint about 20km from the capital on the Tbilisi-Gori road, said he had seen a column of about 60 Georgian military vehicles, including troop carriers and at least two anti-aircraft guns, heading in the direction of Gori. A source travelling with the column said it was going into a South Ossetian village. The Georgians said they were "on a humanitarian mission". In Tskhinvali, the South Ossetian capital, the main offices of the local administration are a blackened shell, our correspondent reports. There are apartment buildings all around with smashed windows, with bullet and shrapnel damage and gaping holes where there used to be windows. Two Georgian tanks stand on a square near what was the main base of Russian peacekeepers. Residents who are out trying to clear their wrecked homes say they have no water and no electricity. Tskhinvali itself is under Russian control now and there are no reports of any serious fighting, but there is no confirmation as to when the Russian troops will withdraw, a Russian military spokesman said. The US-based group Human Rights Watch said staff who were in South Ossetia on Tuesday had seen ethnic Georgian villages still burning from fires set by South Ossetian militias and witnessed looting by armed militia members. 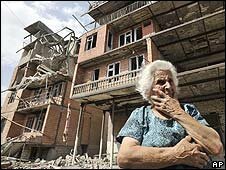 "The remaining residents of these destroyed ethnic Georgian villages are facing desperate conditions, with no means of survival, no help, no protection, and nowhere to go," spokeswoman Tanya Lokshina said. Human Rights Watch also spoke to ethnic South Ossetian women who had spent several days in the woods after fleeing with children and elderly relatives when Georgian troops entered their village. The AFP news agency quotes General Anatoly Nogovitsyn, deputy chief of staff of Russia's armed forces, as saying that in total 74 troops had been killed and 171 wounded, with 19 more missing.